It’s never too early to start planning for your retirement. As the saying goes, you can retire from work, but you needn’t retire from life. Managing your daily expenses and lifestyle desires, like travelling and spending on grand children is a part of what planning your retirement finances can help with. 1. Choose growth assets – Assets which help you create wealth by compounding value are called growth assets. Equity investments fall in this category. Unlike fixed income where the return is determined largely by the interest payable on a security like fixed deposits or bonds, in case of equity, the capital value itself can increase manifold hence, creating wealth. 2. 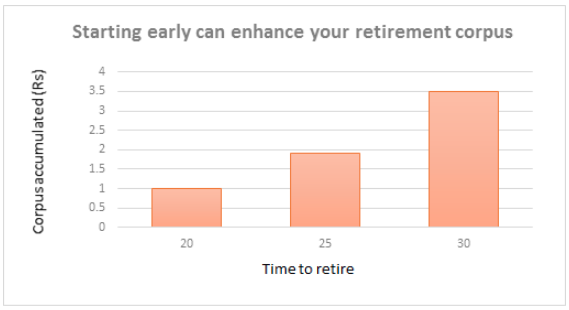 The earlier you start the more you can accumulate – An early start lets you maximise the benefit of compounding. Say you invest Rs 10,000 every month for 20 years towards building your retirement corpus. If the entire amount is invested in equity, at the end of the 20 years, you will have almost Rs 1 crore at an assumed annualised return of 12%. Now, imagine that you started 5 years earlier and continued this investment for 25 years, your accumulated corpus goes up to Rs 1.9 crore and if you started 10 years earlier, it would be around Rs 3.5 crore. 3. Take the help of managed products – Investing for retirement means long term asset growth. While you may be familiar with the dynamics of equity stocks, its not easy to pick good quality stocks and know when to exit. It makes sense to rely on diversified equity mutual funds, where the task is more efficiently done by experienced and professional fund managers. Your task is then reduced to picking a handful of good quality mutual funds and asset managers to trust for long term wealth creation. Lisa Pallavi Barbora has worked in the domain of personal finance for 15 years and now operates her own venture. She also writes on personal finance.